After getting married in Italy, Bollywood’s most lovely couple Deepika Padukone and Ranveer Singh made their first public appearance today. 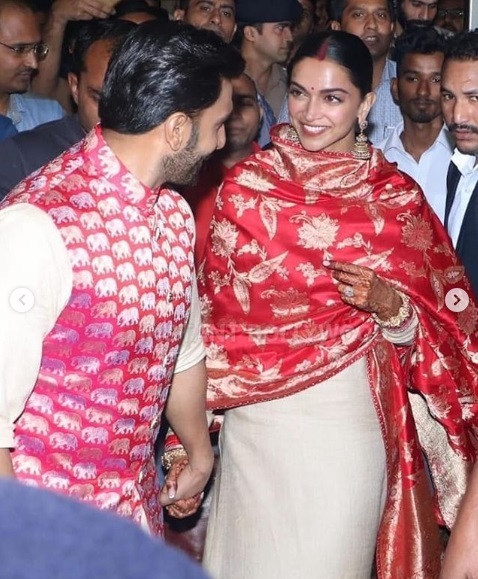 Padmaavat star was all glowing and blushing as she was walking hand-in-hand with the Bollywood’s most eligible bachelor(now taken) Ranveer Singh. Deepika Padukone and Ranveer Singh returned from their Italy wedding and touched down Mumbai airport today. 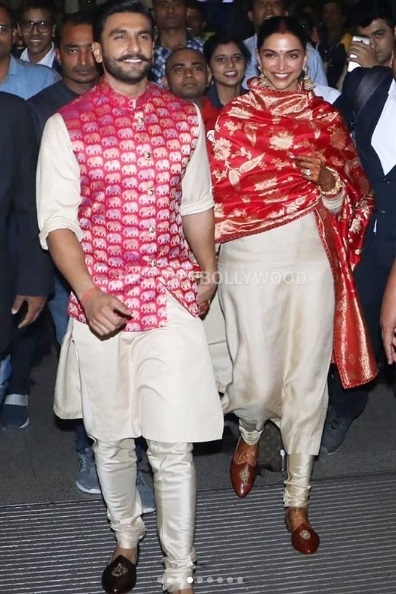 The couple – DeepVeer made a striking entry twinning in Sabyasachi’s couture. 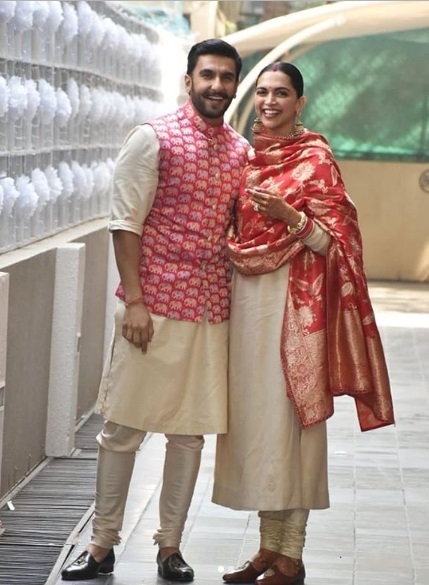 Ranveer looked handsome and truly a married man in a traditional ivory kurta – Pyjama and a pink-golden jamavar nehru jacket. Whereas, his bride and ladylove appeared to be radiant in an ivory salwar and golden red dupatta. However, we were awe struck seeing sindoor on her forehead and chuda in her hand. There was a huge crowd of paparazzi at the airport to capture the first glimpse of just married couple. 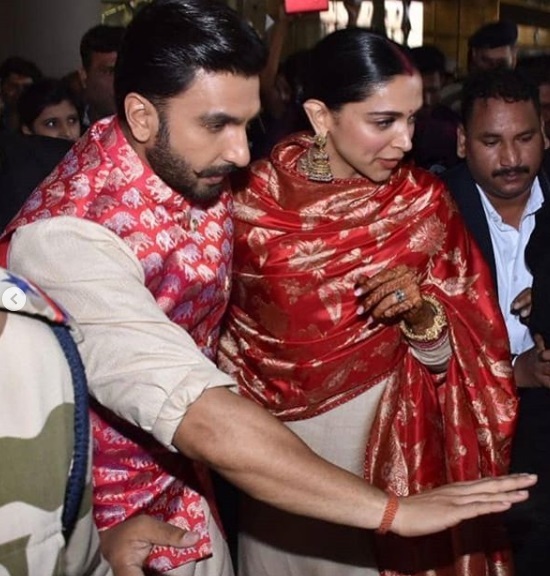 Ranveer is seen in the video protecting his bride from the mob and totally giving us Ideal Husband Goals 💖. Upon landing, the couple headed towards Ranveer’s home ‘Shree’ and the duo happily posed for the cameraman. Deepika and Ranveer will host three wedding receptions — one at Deepika’s home town Bengaluru, followed by one in Mumbai on November 28 for press and last one of course for their industry friends on December 1 at Mumbai’s Grand Hyatt. We wish happily ever after to this beautiful couple whose love story will inspire many more. Subscribe with Eventznu and Follow us on Facebook as more pictures and videos from #DeepVeer’s wedding coming soon. Previous : Say Hello To Mrs. Bieber! Hailey Baldwin Changes Name to ‘Hailey Bieber’ On Instagram!